An official 501(c)(3) since 2007, Lauren’s Kids is based in South Florida and educates adults and children about sexual abuse prevention through in-school curricula, awareness campaigns and speaking engagements around the country and the world. In 2016, Lauren’s Kids was one of six recipients of Homestead-Miami Speedway’s Driving for a Cause grant program, which focuses public attention and funding on South Florida youth and educational initiatives. "The team at Homestead-Miami made us feel right at home and the excitement of the whole day was infectious. This was our first experience at the racetrack with Pit Passes and it was nothing short of wonderful. We never expected for the NASCAR pit crews to be so accessible and very friendly, and then to see the drivers come out and join their teams just before the race was fantastic! No wonder NASCAR fans are so wild about the sport! The teams and drivers were all very down to earth and very fan friendly. It was an honor to have been selected among the favorite charities and to have been awarded a grant by Homestead-Miami Speedway’s Driving for a Cause. We are so grateful to have been a part of the awards presentation with track president Matthew Becherer just before the race. It’s an experience not to be forgotten and we hope that we will have the opportunity to continue to work with the teams from Homestead-Miami Speedway and the NASCAR Foundation for many years to come. Thanks to the grant from Homestead-Miami Speedway we have been able to provide personal safety and abuse prevention curriculums as well as Guides to Hope & Healing in both English and Spanish to the folks from MUJER, which is located in Homestead-Miami. Thank you Homestead-Miami Speedway and the NASCAR Foundation for helping us in the fight to prevent childhood sexual abuse. We could not do what we do without the support of key partners such as you." When were you founded? 2007 – we are celebrating our 10 year anniversary this year! What is/are your location(s)? Lauren’s Kids has offices in Aventura and Tallahassee, but our work impacts communities across the state, country and world. What do you do as an organization? Lauren’s Kids works to prevent child sexual abuse and help survivors heal; we complete work in the areas of education, awareness and advocacy, armed with the knowledge that 1 in 3 girls and 1 in 5 boys will be victims of child sexual abuse before their 18th birthday, but that 95% of this abuse is preventable through education and awareness. We have a personal safety curriculum – Safer, Smarter Schools – in more than 65,000 classrooms across Florida and beyond, and have created resources for families, law enforcement officers, community and youth-serving organizations, and more. We also host an annual 1,500-mile awareness walk, called the ‘Walk in My Shoes,’ each year. Our founder and CEO Lauren Book began this journey eight years ago, and it has become an annual awareness-raiser in communities across Florida, from the southernmost point in Key West to the steps of the Florida capitol in Tallahassee. We have also worked with lawmakers to advocate for the successful passage of nearly two dozen laws to protect children, keep predators at bay, and help survivors heal. How has Driving for a Cause helped your organization? 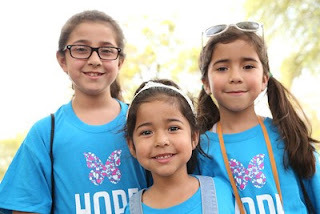 Driving for a Cause has helped Lauren’s Kids provide life-saving resources to Homestead-Miami Speedway’s local community of Homestead, Florida. Thanks to the funds granted, we’re able to partner with MUJER, a community aid and sexual assault treatment program, to provide the ‘Safer, Smarter Kids’ prevention education and personal safety curriculum program, as well as Spanish-language copies of our ‘Guide to Hope & Healing’, which helps provide guidance to families after a child’s disclosure of sexual abuse. We know we can prevent 95% of instances of sexual abuse through education and awareness, and that those who do fall victim can heal into thriving survivors with care, support, and trauma-informed counseling. Thanks to Driving for a Cause, we are able to bring these important resources to an underserved community, in the Speedway’s backyard. What are your goals for 2017? 2017 is the 10th anniversary of the Lauren’s Kids foundation. We are proud to have been working to prevent abuse and help survivors heal for a decade, and will continue this life-saving work in 2017 by partnering with schools, law enforcement and youth-serving organizations. We hope to provide prevention and personal safety education to even more children, encouraging parents to bring these lessons home through our ‘Family Safety Plan’ generator (visit www.safersmarterfamilies.org to learn more!). We will also be completing our eighth annual ‘Walk in My Shoes’ 1,500 mile awareness walk across the state of Florida, and creating new resources related to human trafficking prevention and safety lessons for children with special needs. What can you recommend to organizations applying for the grant program in 2017? The application process is clear and concise, get it done early and send it in. The team at Homestead-Miami is wonderful to work with and will be helpful should you have any questions. Homestead-Miami Speedway’s charitable outreach program, Driving for a Cause, is now accepting applications for financial gifts to be awarded to eligible 501(c) (3) charities as part of its 2017 grant program. Applications can be found at www.HomesteadMiamiSpeedway.com/DrivingForACause.